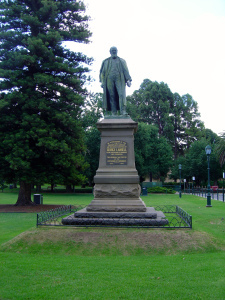 Late Victorian and Edwardian marble and bronze sculptures, statues and busts are quaint relics of the central Victoria gold rush in the centre of City of Greater Bendigo. The highlights of this collection are works by some of the leading sculptors in Australia: James White and Charles Douglas Richardson. There are also works by some less well known sculptors, R.G. Summers and John Walker that tell us as much about the history of that time as the works of more famous sculptors. 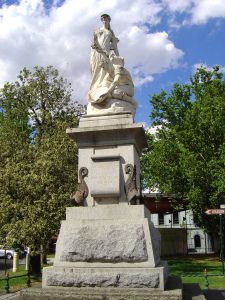 On the Corner of Bridge St and Pall Mall is Charles Douglas Richardson’s The Discovery of Gold, 1901-06, with three bronze base relief panels around the base showing the history of mining in Bendigo. Today is Good Friday 2015 and on Good Friday 1994 Clifford Possum Tjapaltjarri AO and I decided to create a collaborative painting as an expression of the day. Given that this renowned Aboriginal artist basically took over this project it might be a bit of a stretch describing it as a collaborative work, but whatever tag is placed upon it, that which is a constant is that this work is a creative gem that gives expression to Christ`s crucifixion in the manner of Aboriginal Art. 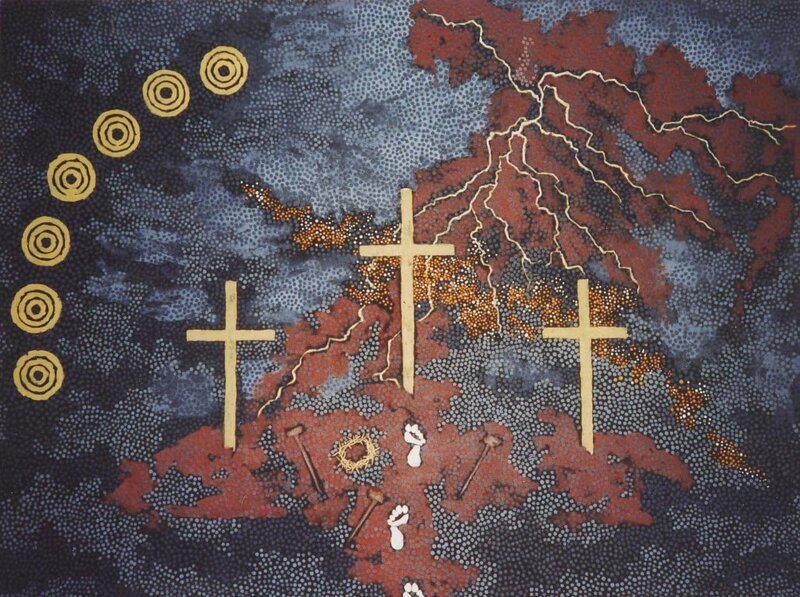 Clifford Possum Tjapaltjarri AO, who died in 2002, described this work as showing God`s anger over the crucifixion of his son, which is expressed by the storm filled atmosphere depicted through the grey cloudy background overlaid with grey dots and lightning. Here too, we see Christ`s foot tracks leading to the middle cross, while his crown of thorns and nails are shown on the ground- the murderous deed has been done. In addition to God`s anger, the artist also gives expression here to grief in the form of seven concentric circles, which are a symbolic expression of seven Ancestral Sisters, who came to be stars when they journeyed to the Milky Way to escape the advances of a `dizzy` old tribal man. In this painting, however, the sisters are shown watching the crucifixion and the grey dots that lend to the storm and God`s anger double to give expression to the Sisters` tears. This work was sold in 1994 and was included in the Clifford Possum Tjapaltjarri AO Retrospective 2002-2003. Since then Good Friday was resold at auction for AU$40,000.00 with only one bid. I do not know who the bidder was, but I do know that there was a terrible failure in the Australian Art Market on that auction day when only one bidder was able to recognize this painting as a Masterpiece, which remains important to this artist`s body of work and his own personal history and, of course, to the History of Aboriginal Art.